Can you believe Woolworths now stock the latest, high performance brushes by Platinum for a reasonable price? The Make Up Brush Collection by Platinum now stocks in Woolworths, Australia. You can now look to purchase high performance brushes at a reason price and without going over your budget. The make up collection has been designed by make-up artists in Australia and what you will find about the brushes is that they are so soft and have a precision cut with synthetic bristles. The handles of these make-up brushes feel so comfortable to hold and come in a two toned colour being silver and gun-metal. They are also ideal for those who get close up to the mirror. They definitely look sleek and most importantly they feel very plush soft which doesn't feel harsh on the skin. It's so important to note that your brushes should feel soft whenever you are applying on make-up onto your face. Additionally, not only have they also released a new line of make-up brushes, but also make-up sponges too - which help you to get a flawless foundation look for your face. For more affordable sponges in the longer term, these will help you to do the job and make sure you keep on replacing them every few months or so. Eye Shadow Brush - RRP $9.99 - You get a full rounded shape for the eyeshadow brush which is perfect for applying the eyeshadow shades all over your eyelids, for blending purposes and most importantly to blend it evenly well. Contour Eye Brush - RRP $9.99 - This contouring eye brush is tapered so that you can look to create some dimension for your eye crease. Alternatively, you can look to use this brush as a contouring brush for the bridge of your nose too. Blush Brush - RRP $18.99 - This is the perfect blush brush that comes in the form of powders. It helps to blend blush precisely all over the cheeks with a bit of dimension to it. The brush has a nice and plushy soft feeling to it which make applying on blush so much more comfortable and fun. Base Blending brush - RRP $14.99 - This brush has been shaped precisely so that you can look to blend on foundation with a flawless finish to it. Ideally, I would use this brush with liquids or cream foundations. Alternatively, you can look to apply on your liquid or powder highlighters with using this brush also. 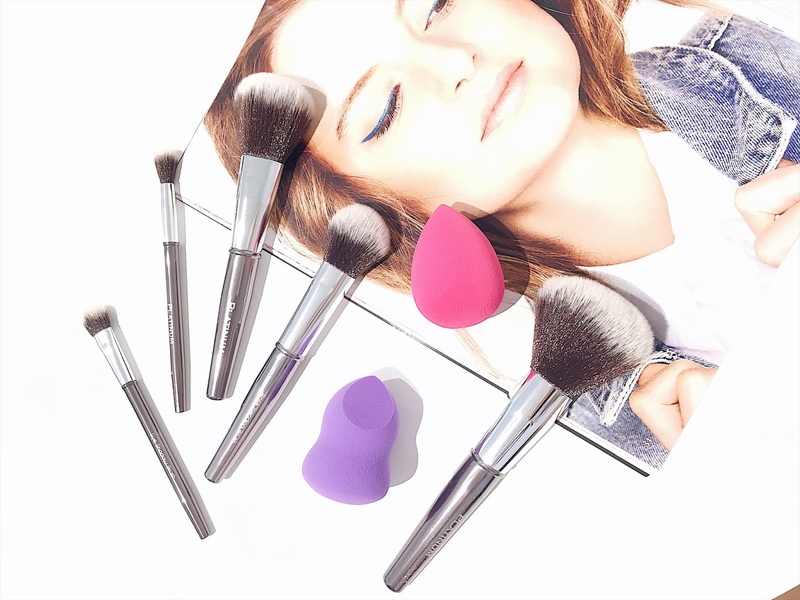 Power Brush - RRP $19.99 - This is the perfect brush to set your loose powders evenly onto your face. It has more bristles on this brush which allows you to blend any powders used really nicely onto your face, plus they feel so plush soft! Flawless + Precision Sponge Set - RRP $9.99 - These are the perfect sponges made for blending and contouring of the face. So the teardrop shaped sponge looks to build and blend your foundation. I used this sponge by simply spritzing it with some facial mist so that it's a little damp for make up application. It helps to blend my concealer and foundations on really well which I am overly impressed with. Then, we have the purple shaped sponge which is also made for concealing in the hard to reach areas (mainly around the nose and under the eyes). It's also amazing as a contouring sponge and helps me to do the job that I need. What did you think if the new Platinum Performance Beauty collection? Thank you Platinum for supporting me for this review. My reviews are based on my own experiences and I only recommend products that I truly believe in.